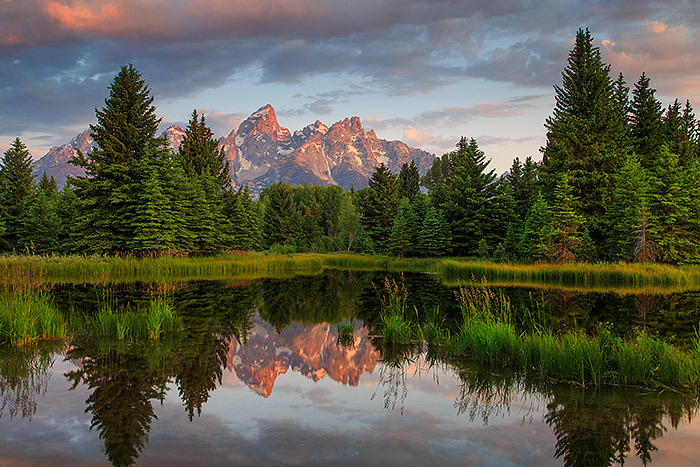 The Grand Teton and the Teton Range do their best to help celebrate a beautiful fourth of July at Grand Teton National Park. Beautiful clouds glide over the range as the first rays of color the sky and peaks. The beaver ponds at Schwabacher's Landing are smooth as glass on this windless Wyoming morning. Photo © copyright by Thomas Mangan.